The critical role that social media and the Internet are playing in the anti-government protests engulfing Istanbul and other parts of the country has not gone unnoticed by Turkish authorities. Only days after Turkey’s Prime Minister Recep Tayyip Erdogan labeled Twitter a “menace” and dismissed protesters filling the country’s streets as “looters”, police arrested dozens of people accused of publishing “misinformation” on Twitter to encourage others to join in the ongoing unrest. It was not immediately clear which posts led to their detainment. But various news outlets indicated it might be for publishing a photo of a police officer attacking a young woman in the western city of Imzir, republished [fr] on the cover of Turkey’s Taraf newspaper on June 6. Authorities released 33 Twitter users, some of whom are high school students, on June 6, 2013, but not before earning retaliation from hacktivist collectives Anonymous and the Syrian Electronic Army, who claimed that they hacked the websites of the prime minister and the Ministry of the Interior. 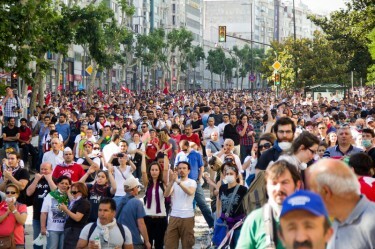 Thousands of protesters gathered in Istanbul on June 1, 2013 over plans to demolish Gezi Park and create a new shopping mall. Photo by Marooncomtr. Copyright Demotix. An unprecedented wave of protests has gripped Turkey for more than a week, earning a heavy-handed response from authorities who have combated demonstrators with water cannons, large amounts of tear gas, and violence. The movement grew out of resistance to the demolition of Taksim Gezi Park in Istanbul to build a mall, but quickly snowballed into demonstrations of the people’s discontent with the government’s policies. Social media has become the mainstay for the protesters to spread the word and organize, report clashes with the police forces, and offer an alternative source of news to mainstream media which has treated the demonstrations with silence. According to a study released last week from New York University’s Social Media and Political Participation laboratory, Turks have sent an “extraordinary” number of tweets related to the uprising, with around 90 percent of the geolocated tweets coming from within Turkey and 50 percent from within Istanbul. Compare that with the 30 percent of tweets coming from within Egypt during the revolution in 2011. Turks living outside of the country have also made use of social media. A trio of Turks living in New York have raised the 52,000 US dollars necessary to take out a full-page ad in The New York Times in support of the protesters using crowdfunding website Indiegogo. As users descended on Twitter and Facebook to make use of the sites for organizing, it appeared access in Istanbul was throttled. The sites were not officially blocked, but loading times were significantly slower than usual, particularly for users seeking access through 3G networks. Fueled by fears that the government could tighten its grip on the Internet even more, downloads of VPN software are up by some 1,000 percent in Turkey. Facebook users also have reported the website blocking a tool helping protesters to organize, though it’s not clear if the blocking is generated by an anti-spam filter or is also a targeted effort. 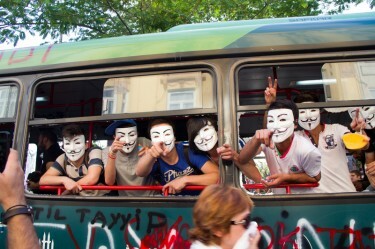 Protesters wearing ‘Anonymous’ masks in Istanbul on June 1, 2013. Photo by Marooncomtr. Copyright Demotix. There's no culture of management of social media content, and there won't be. After the first days of the protest, photos and videos started to repeat with false titles, locations, and dates. 140journos has made a difference by filtering and verifying information, with the aim of preventing disinformation and provocation. Users can tell the police that our account was hacked by Redhack, we would take the blame with pleasure. For those looking to get involved, Amnesty International recommends to spread the word and write to the Turkish government.